FLY FISHING FLIES ARE YUMMY, BUT TROUT LOVE REAL FLIES. YOU NEED TO FOOL THEM. Tip: Set that hook fast or wave goodbye. Fly fishing flies - the choices can make you bug-eyed. There are dry flies, wet flies, nymphs, terrestrials, stimulators, and more. My goodness, the list is nearly endless. I have 5 boxes loaded with fly fishing flies of almost every false buggy creature on the planet. Is it enough? No, of course not. Can I ever use them all? Probably not, but who cares. I love my bugs. Bugs are my friends. So every so often I open all the boxes and gaze lovingly at the variety. Then I go fishing. Fly fishing flies are imitation temptations. But a trout can spit it out in less than 1/10 of a second, so you've got to set the hook immediately. Real insects are tasty morsels to fish, often easy to gulp and high in protein. Your job is to fool the fish using a nifty looking artificial because it's really difficult to attach a hook to the real thing. Seriously, if for example, the PMD (pale morning dun) or the BWO (blue-winged olive) looks like dinner to a trout, you're in business. Don't forget to check the underside of your imitation carefully. This is the side that your fish sees on its way up to the surface for a meal. One of the very best books I have ever read on the subject of insects and the fly fishing flies that imitate them is the Handbook of Hatches by Dave Hughes. If you are not into entomology, you probably will not be excited about the subject matter. If you are into bugs and like to fly fish using fly fishing flies (artificials) then this is a great read. I thought it would be dry reading but I was pleasantly surprised. Dave gives us the guide to matching the hatch by explaining in simple terms the life cycle of various insects and how a fly fisherman uses that knowledge to gain an advantage over his quarry--Mr. Fish. If you love fly fishing you are probable an amateur entomologist as well. I am going to quote two paragraphs from Dave Hughes's book because they set the tone for all that comes afterward in you quest for (in this case) trout. Chapter 1: Trout Don't Speak Latin"Trout eat aquatic insects. They eat other things, too. They eat grasshoppers, scuds, snails, leeches, and sometimes even each other. But all trout get going in life eating aquatic insects. And most trout, including lunkers that make a lot of their living pursuing bigger bites, end their lives still eating aquatic insects. Trout don’t read Latin. They can't identify insects. The most brilliant trout in the stream will spend its entire life gobbling mayflies, caddisflies, and stoneflies in all of their immature and adult stages, without ever pausing to consider what it has just eaten. Trout can be alarmingly selective, however, despite all of their ignorance." Have you ever heard the term Match the Hatch? It basically means that you sort through all your fly boxes for the one perfect fishing lure, the fly fishing fly of all time, (yes, the fake thing with the hook attached) that you believe best represents the real flies that are either living underwater or emerging into adulthood and sprouting wings. If you can do that, you are halfway to successfully capturing your prize fish. The other half will involve proper presentation of your artificial. Click this line to learn more about CASTING YOUR FLY. The most fun I've ever had was presenting my artificial dry fly to a trout and watching him smash the surface trying to inhale it. Now, that's fly fishing at its best. 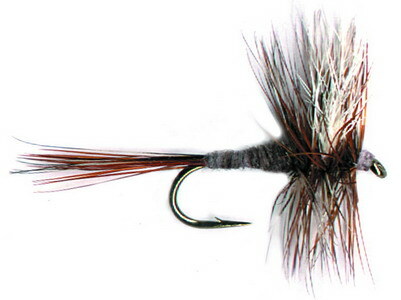 Click here for a list of the most POPULAR FLY PATTERNS from around the U.S. These fly fishing flies come in a vast variety of colors, shapes and sizes. So choose carefully and have fun.